Canadian based web series and blog. We are a community of #WomenWarriors highlighting resiliency and strength of women and girls. Today, we are inspired by Kar Bell! We LOVE our Project Women Warriors Community! We have been in awe of all your submissions. Today we are highlighting Kar Bell who messaged us through Facebook. Kar Bell works fulltime at BCIT as an educator for professors and children. She finds happiness, love, and healing through children. “My mother was a jack of all trades she was a nurse, social worker, worked at the casino as a supervisor, and worked her whole life while taking care of her family. She truly is my inspiration. Today, we want you to meet Taylor! Hi! My name is Taylor, I am 18 years old and I’m from Port Moody, BC. I just finished my first year at SFU and work at Rocky Point Ice Cream. When I was in elementary school, I was diagnosed with dyslexia. In grade 5 I had the reading level of a kindergartener. This was an extreme struggle and resulted in me developing an anxiety disorder at a young age. I hated school and I dreaded going every day. I always had people judging me and looking at me like I was less than they are just because I couldn’t read. I had multiple teachers tell me I would never graduate high school, let alone me ever attending post secondary school. My mom through it all was alway by my side and told me to never think that I’m not enough. She always pushes me and has supported me in so many ways. My sisters have always been by my side every step of the way and has always kept a smile on my face. With out my sisters and my mom I would have never had the strength to graduate high school with good grade and being accepted into multiple post secondary schools. They inspire me everyday and I don’t know what I would do with out them. Hey! I’m Dani. I am 22 years old and I live in Victoria, BC. I work for Island Health doing kindergarten screening and I am also a Photographer! I love the idea of this project because I strongly admire all the women around me who have influenced me in my day to day life. I work with women, I was raised (a lot of my childhood when my dad was at sea) by two STRONG and BEAUTIFUL women, and I just recently did a interview/photography project on 18 local female musicians in Victoria. Through my enentire life until this last year I had breasts that were far too big for my stature. I wanted what every girl wants, to be comfortable in her own body, fit at least some of the trends, and to not have that be the focus of every dude when at a bar, date, etc. ( it had even had gotten to the point where I had been grabbed there, or verbally harassed because they clearly “stood out” to a male at a concert while I was taking photos). I had a breast reduction in Decmeber of 2017 because I had problems with my neck, back, and shoulders. It changed everything. Waking up in the morning I felt better. I felt lighter, more confident INSTANTLY. I know you shouldn’t HAVE to modify your body to help your confidence, but because of the issues with my back and whatnot, it helped so much and I will never look back. Women face so many challenges every single day. In the workplace, at a concert venue, in a bar, on the street, everywhere. Its ridiculous, BUT the best part about being a woman is that we have a strong force of sisters that are all able rising up together and say enough is enough. The reason I chose my mum as my women warrior is because she has always pushed me to be the very best version of my self. I see a lot of her in me every single day. Shes generous, tough, smart, witty, brave, talented, beautiful, and funny. Shes always shown leadership and was very excited when I started my Women for Women project this last fall. She helped so much. She raised two girls while our dad was away at sea with the Navy. My mum as well had a 37 year career in the military and now works for Island Health as well, after retiring (for a week). She is everything in a person I hope to be one day, and I am so incredibly grateful for her. Today, we are highlighting Diane! Chloe is a #GIRLBOSS and our Wednesday Warrior! Hello! My #womanwarrior is Oprah. Of course my mother will always be my strongest pillar, but I have to thank her for introducing me to Oprah at a young age. After school every day I would come home to sit with her on the couch, watching and listening to the ways in which so many people faced adversities and how they overcame these obstacles through Oprah’s show. This impacted me by allowing me to believe in myself and by teaching me to treat others with respect and compassion. My name is Kelly, I’m 42, a mother of 4 (twin daughters that are 10, a 16 year old stepdaughter and 20 year old stepson), the Manager of Vancouver Island University’s Student Residences and a Wellness Advocate for DoTerra Canada. My Women Warriors are foremost my amazing Aunts and my Grandmothers – without them I wouldn’t be the woman, mother, partner and professional I am today – they provided such support and positive role modeling when my own mother couldn’t. My Femme Friends and Colleagues are my everyday circle of support, they keep me grounded and also motivated to keep on learning and growing. “My name is Zuri, and I’m a wife, mother, birth doula and 2-time breast cancer thriver. 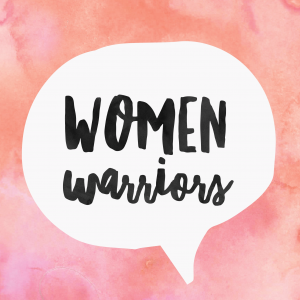 I initially found it challenging to come up with one person who represented my Woman Warrior, when nearly every woman I know has impacted my life in significant ways. When I was diagnosed with cancer, the women in my life, aunts, cousins, sisters, friends and my mother-in-law, all came to my aid. They were strong for me when I couldn’t be and they helped take care of the things I couldn’t, giving me the time, energy and space to fight and heal. Yet, my biggest, most important warrior was, and still is, my mommy. She took us in (my husband, son and me) when I was undergoing treatment. She nursed me, loved me and pretty much raised my son for a year. I often joke that my son has two mothers – but joking aside, I am so grateful for the bond they now have because of that time. We are both so lucky to have such a Woman Warrior in his life.